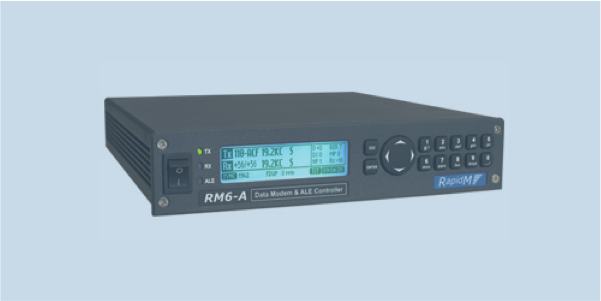 RM6-A is suitable for long distance (up to 10 000 km) point-to-point data communications is designed to operate in conjunction with an external STANAG 5066 ARQ server and is built with the latest generation hardware & software. RM6-A offers a built-in 2G ALE controller option. Maximum data rate is 9600 bps over a standard 3 kHz (SSB) HF radio channel and 19200 bps over an ISB channel. The unit is intended for installation into 19” rack systems or to be used as a desktop unit. The front panel (LCD display and keypad) provides full local control of all settings and functions.